Who doesn’t love food on a stick? 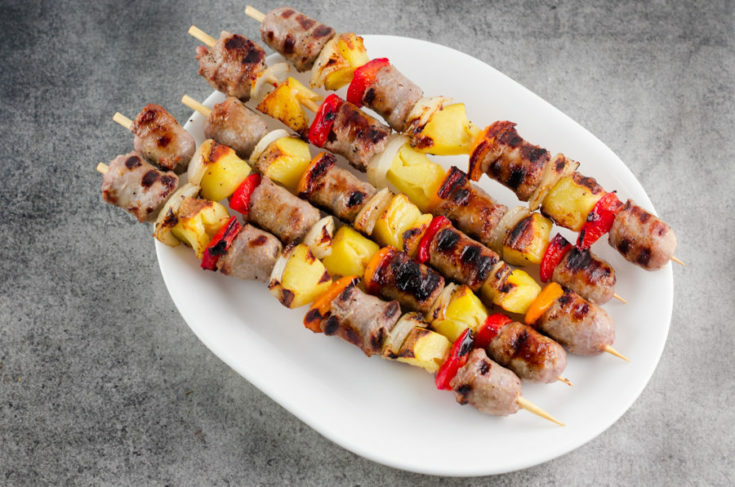 This Bratwurst kebabs recipe with potatoes and peppers combines all your favorite summer grilled flavors together. Mr. Savvy is half German and was born in Germany, living there for several years as a child before moving to the states. Needless to say, he’s very much a meat and potatoes kind of man and appreciates a good beer. 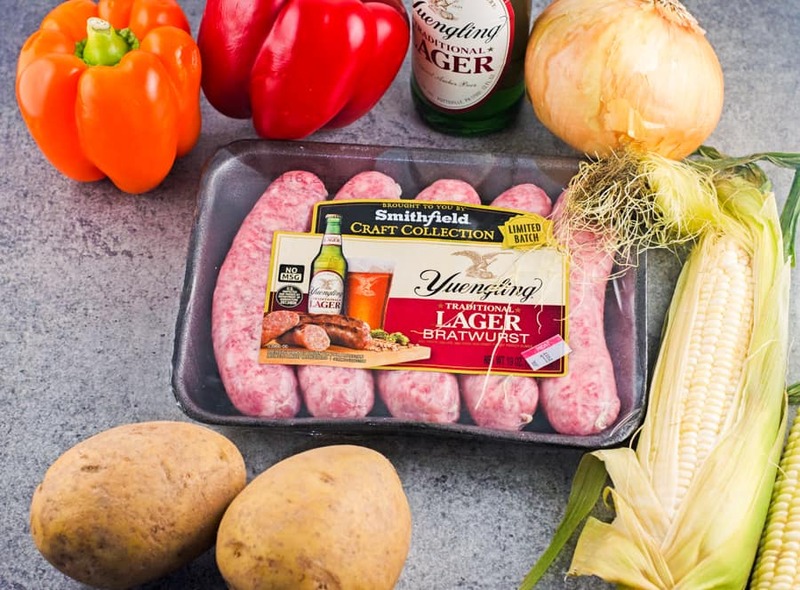 When I was looking for something to grill at Kroger the other day and I came across Smithfield® Yuengling® Bratwurst, it kind of felt like a match made in heaven. We often purchase Yuengling Lager and Smithfield, VA is right next door to us so we take pride in having so many delicious pork products being made nearby by a company that values quality and flavor. Smithfield Yuengling Bratwurst is available at Kroger, Dillons, Food 4 Less, and Ralph’s. You can even save $1.00 when you purchase ONE Smithfield Yuengling Bratwurst along with other great savings by using these Kroger digital coupons. 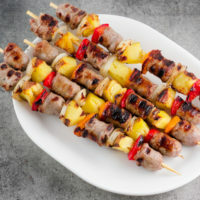 These bratwurst kebabs are perfect for summer as they can easily be cooked on the grill and won’t dirty up a ton of dishes. Plus, it’s an all-in-one meal so you don’t have to worry about watching multiple things and making sure they’re all done at the same time which is especially nice when you have guests. 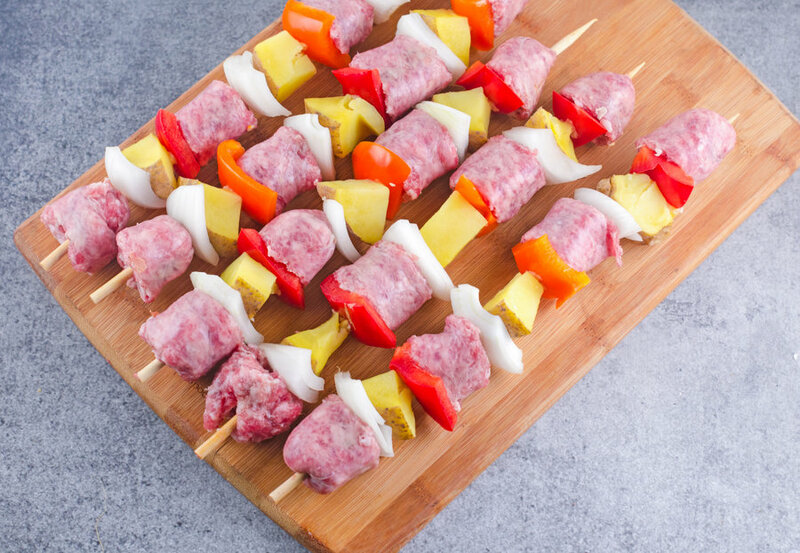 I made these kebabs with the Smithfield Yuengling Bratwurst, chunks of Yukon Gold potatoes, and slices of bell peppers and onion and then brushed them with a mix of oil, beer, and seasonings while grilling. 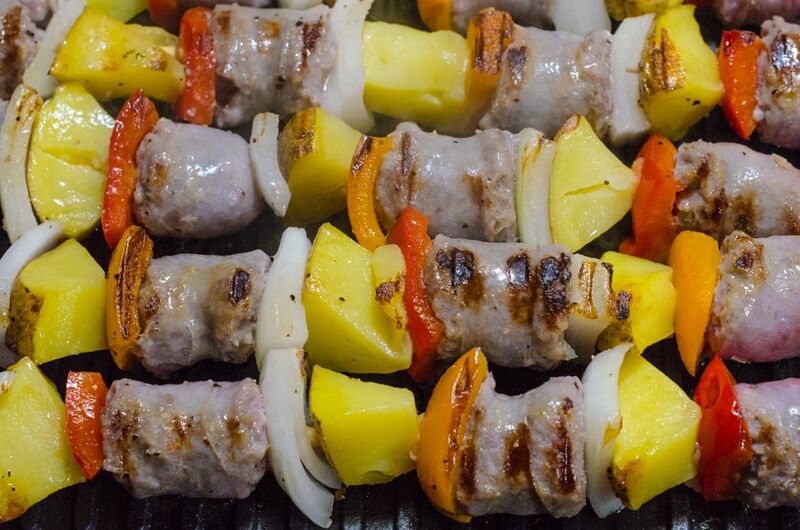 If you’d like more veggies I think the bratwurst kebabs would also be great with slices of zucchini and yellow squash, or maybe even some grape tomatoes. I was going to put corn on the cob on the kebabs as well but it was honestly taking too much time and effort to cut into small enough pieces and then get them on the skewer, so I decided to have it on the side instead. Since I used some pretty hearty ingredients that are on the larger size, I did opt to use the wider and larger wooden skewers so I didn’t risk them breaking. When using wooden skewers do make sure to soak them at least 10 – 30 minutes in warm water before threading on the food and cooking so the skewers don’t burn. 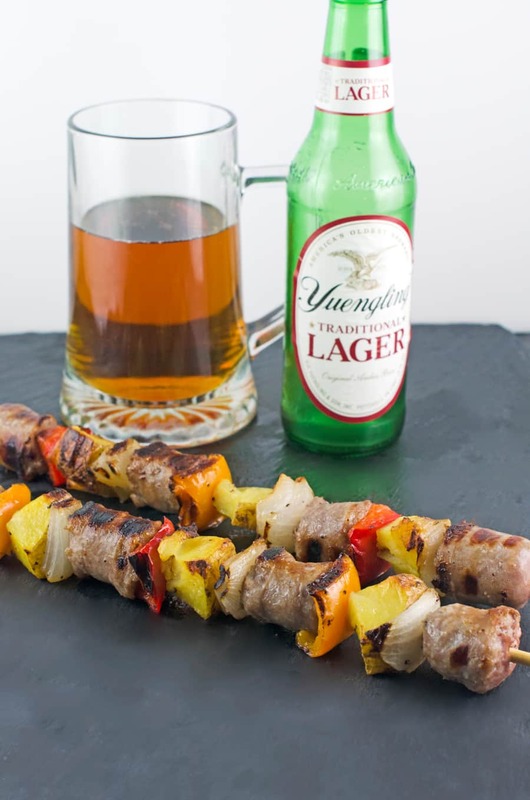 The bratwursts are infused with real Yuengling Traditional Lager so it only made sense to serve up some of the lager along with the kebabs. The roasted malt with its subtle sweetness makes it pair wonderfully with just about any grilled food. So good! I also find the kebabs to be a nice balance of flavor. 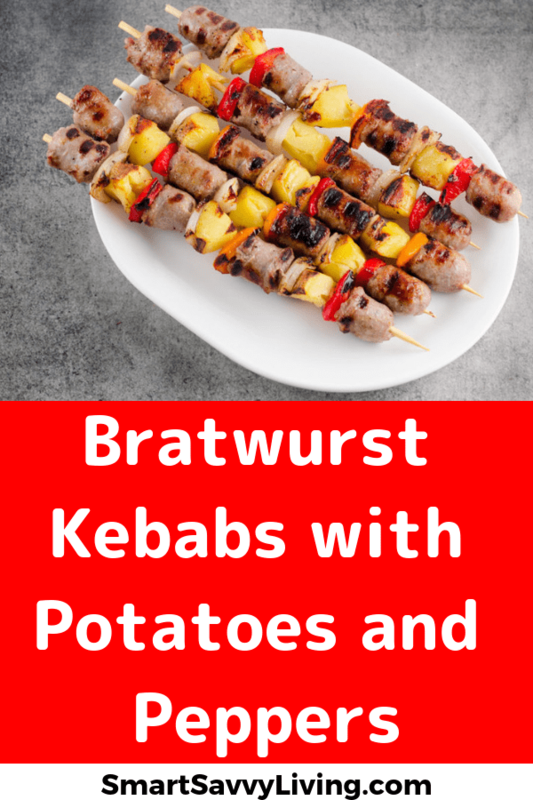 You get a bit of sweet from the peppers and beer, some savory from the onions and potatoes, and then it’s all tied together with the pops of juicy, meaty flavor from the bratwurst that’s made with premium cuts of pork and a special blend of sweet and savory spices. My mouth is watering just thinking about it. It’s a good thing I bought a second pack of brats to make these again soon! If using wood skewers, soak in warm water for at least 10 - 30 minutes. Wash/scrub the potatoes clean and chop into large bite-sized pieces. Place into medium-sized microwave-safe bowl. Microwave potatoes on high for about 5 minutes or until the edges have started to soften. I like to give the bowl a shake after about 3 minutes. Uncover once cooked to cool. In the meantime, cut the pepper and onion into 1 to 2-inch slices. Quarter the bratwursts. When the potatoes are cool enough start putting the kebabs together. You can use whatever order your like. I did bratwurst -> onion (2 slices) -> potato -> pepper then start with the brats again, repeating until you've put 4 pieces of bratwurst on. Mix together oil and beer with a pinch of salt and pepper. Brush hot grill with oil (not the beer oil mix) and place the kebabs on to cook. Brush with oil and beer mixture. Cook for about 4 - 5 minutes per side or until bratwurst is cooked through and veggies have softened, brushing each side with more oil/beer mix. Watch for any flare-ups to move kebabs as needed. Once cooked through, allow to cool a minute and then serve immediately. Refrigerate leftovers up to 3 days. If you have any leftover vegetables they make a great hash or egg scramble the next morning.